I use Windows 7, and I am happy with it. I really have no complaints at all. I have tried Windows 8, in fact, I now use it at work, and it is a bit of a PITA really. Windows 7 is much cleaner, with a good old-fashioned start menu and simple desktop. But, as we know, Windows 10 is here! Woot! But, I am really not interested at all. I have read one or two things about Windows 10, and my conclusion is that I really do not need it. I am sure for some people it will be awesome, but I cannot see it improving the way I check my emails, write blogs and mess about on Facebook. Almost everything I do on my Pc is in Chrome these days, Windows won’t (or shouldn’t) change how that works. Doing nothing seems to be the best option, whereas upgrading from 7 to 10 poses a risk to the status quo. OK, the upgrade will probably go smoothly, but what if it does not? One of my hard drives is pretty full already, my PC is a few years old now (I think I bought it in Spring 2012), and it runs Windows 7 nicely, but will it run Windows 10? To be honest, I really don’t care! But, this evening I have had TWO annoying pop-ups from Window to tell me that I need to download Windows 10. I closed one, and assumed, or at least, hoped, that this would be a strong message to Windows to say “not interested”. But, about 15 minutes later, another annoying pop-up. 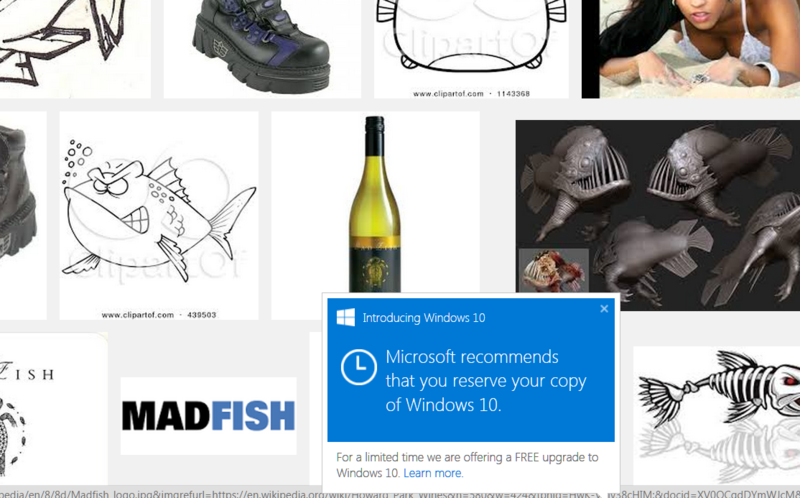 How long will I have to endure these pop-ups from Microsoft? Will I eventually succumb to their aggressive marketing tactics and install Windows 10? Update: the only solution I could find was to install Windows 10! Unfortunately I did not find a solution and just caved in and updated. Fortunately, apart from having to ditch Avast! free AV and use an alternative so my start bar works, nothing else went wrong.